VIT University invites applications for admissions to undergraduate programmes in Hotel Management. 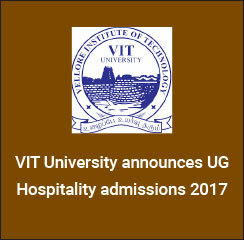 Candidates seeking admissions to B.Sc programmes in Catering and Hotel Management can apply for VIT University admissions 2017. Candidates can check here all about VIT University admissions for Hotel Management programme including important dates, application procedure, eligibility criteria and selection procedure as mentioned on this page below. The application form for VIT University admissions 2017 will be available in online as well as offline mode. Candidates can obtain online application form from the link provided below. For offline application form, candidates can visit the official address as mentioned below. Candidates need to remit fee for application form i.e. INR 350. Candidates will be offered admissions on the basis of 10+2 qualifying exam scores. * Academic Fee as per last year. Meritorious candidates will be given 30% Fee scholarship. *Tentative dates as per last year’s schedule. VIT University was established with the aim of providing quality higher education on par with international standards. It persistently seeks and adopts innovative methods to improve the quality of higher education on a consistent basis. The campus has a cosmopolitan atmosphere with students from all corners of the globe. Experienced and learned teachers are strongly encouraged to nurture the students.